Jordi Savall's office in Spain was quite certain, he really wanted to give an interview On An Overgrown Path when he was in Norwich. The maestro (above) even phoned me back from his home in Barcelona to say yes, he would definitely find time. I couldn't raise him again on his mobile phone after he arrived in England, but on the morning of the concert I met him at his signing session and he told me to come to the concert venue of St Peter Mancroft at the end of the sound-check at 6.45pm, and he would do the interview between the rehearsal and the 7.30pm concert start. But I arrived at St Peter Mancroft at 6.30pm to find a disaster. The taxi sent to collect him had arrived at his hotel 30 minutes late. So everything was behind schedule and the event manager thought an interview was unlikely. But a message came back from the maestro, he would do the interview after 7.00pm. The sound-check finished late at 7.05pm and as the capacity audience started to fill the church a charming but tired Jordi Savall said he wanted a cup of tea before facing my microphone. Just after 7.10pm the recording started to the side of the stage in view of some of the audience and soon it really started to flow. But with five minutes to go to the concert start time and only half my questions asked it looked as though On An Overgrown Path might go down in history as the first blog to delay the start of a Norwich Festival concert. So I decided discretion was the better part of valour and bailed out using my scripted exit which thanked the maestro for his time. At which point, and we were now four minutes from the start of the concert, to my disbelief he said 'I just want to say one more thing...' and went on to deliver a short but inspirational message about the power of music and the need inner peace. He never missed a beat, the concert started on time and was, of course, magnificent. And after it had ended many of the audience wouldn't leave, and the four musicians from Hesperion XXI stayed on stage for some time to talk to members of the audience about the rare instruments they had been playing including an oud, rebab, santur and 100 year old Moroccan drum. The next morning was Sunday, and Jordi Savall was leaving his hotel in Norwich at 7.00am to return to Spain. Before the interview he told me had played 182 concerts last year. 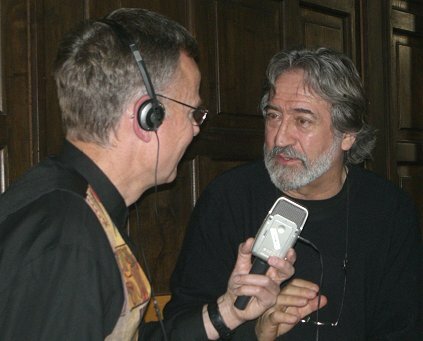 Hear my just-in-time interview complete with audience noise and Jordi Savall's message on inner peace on Future Radio at 5.00pm on Sunday May 25 repeated at 00.01am on Wednesday May 28. Or to the streamed version - less music for copyright reasons - here. The words 'Prayer for inner and outer peace' are written in Beethoven's own hand in the manuscript of his Missa Solemnis over the line in which the 'Dona nobis' theme first appears. 'For Inner and Outer Peace' was also used as the title of a moving book (below) inspired by Beethoven's masterpiece and written by another great musician and humanitarian. Read more about Antal Dorati here. Now playing - the Sanctus from Beethoven's Missa Solemnis in the recording with Philippe Herreweghe conducting the Choeurs de La Chapelle Royale and the Collegium Vocale Gent, the Orchestre des Champs-Élysées and soloists. It is surprising how many of today's 'jet set' conductors have failed to scale this peak of Beethoven's creativity satisfactorily. Like Jordi Savall, Philippe Herreweghe built his reputation in early music, but, also like the Catalan musician, for Herreweghe there is no early, classical or contemporary music, just music. For me Herreweghe's performance, which was recorded live at a concert, is one of the great interpretations of Beethoven's masterpiece, as indeed is Dorati's own on BIS. Dorati's version is still in the catalogue but his book and Herreweghe's recording are both, alas, no longer available. 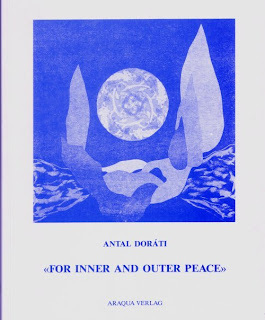 Dorati's book was published by International Physicians for the Prevention of Nuclear War, read more about their vital work for inner and outer peace here. I greatly look forward to the interview, especially since I've been listening to a great deal or Mr Savall's work on Alia Vox's website this afternoon. It's a real shame, though, that nearly every single one of his discs costs upwards around $25!! What an artist, what a human being. How do I find Jordi Savall's performance schedule?